Cottage on Fox Hollow: 21 Years Today Since My First (of 6) Brain Surgeries! 21 Years Today Since My First (of 6) Brain Surgeries! I've always loved that cartoon. 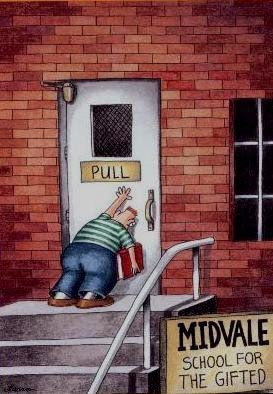 Far Side, in general, never fails to crack me up. I like Far Side too, but I'm a lot happier that you're still here and well. One question though. Is this really unrelated or is this a BEFORE picture? You're a super genius now, aren't you? Some kind of government project? You can tell us, your secret's safe. I mean, no one can make as many quilts and aprons as you do in the short amount of time that you have without some kind of assistance.